I saw the headline and was suspicious. Then I saw mention of the Syrian Observatory for Human Rights, a media agency whose director and sole employee, Syrian born Rami Abdulrahman has not been back to his homeland in more than 20 years, and I became even more suspicious. However, when I saw the White Helmets in the accompanying photos my suspicions were confirmed. Founded by James Le Mesurier, a former British Army officer who went on to be a consultant for private military contractors, the White Helmets specialise in enacting staged “rescues” from attacks that are blamed on the Syrian government. Funded by the British Foreign Office the White Helmets are essentially “crisis actors” used in a propaganda campaign against Assad. The following report ignores this vital background information. Just as it ignores allegations that the Syrian White Helmets are involved in kidnapping children and organ trafficking. The Daily Mail also ignores the Syrian White Helmets’ record as ‘crisis actors’ who have participated in atrocities allegedly perpetrated by Assad’s forces, which have very obviously been staged. So this is NOT NEWS. Like so much of what purports to be “news” now it is essentially propaganda in the guise of journalism, aimed at stirring emotions and rousing public sentiment against Assad. It also features a favoured routine employed in the psychological campaign against President Assad. With photos and stories centred around children who have been allegedly traumatised and wounded because of the actions of President Assad’s forces. Like Omran Daqneesh, who for a while was featured in the anti-Assad propaganda campaign, until his father began speaking out about how his son had been used as little more than a stage prop. 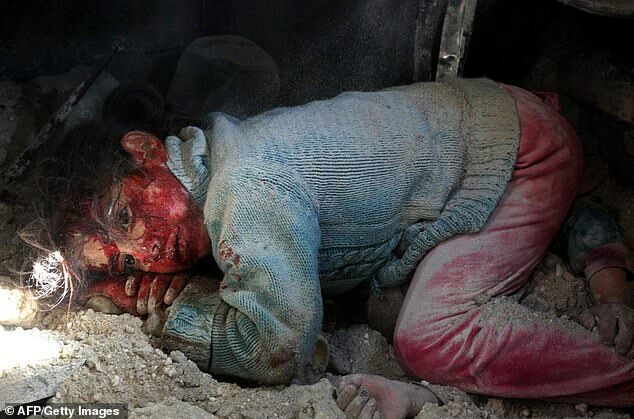 A little girl lay cowering and covered in blood on a pile of rubble burying her sister’s corpse after President Bashar al-Assad’s jets reigned down terror. Air strikes have been stepped up against rebel-held northwestern Syria, the last major stronghold of opponents to the president. Thousands of civilians were forced to flee the town of Khan Sheikhoun, war monitors said on Tuesday. One little girl looked shell-shocked, as dried blood was smeared across her face and hands, while she lay beside the lifeless corpse of her sister. A father was seen covered in chalky dust, with blood running over his hands as he sobbed clutching his daughter’s corpse on the ground. 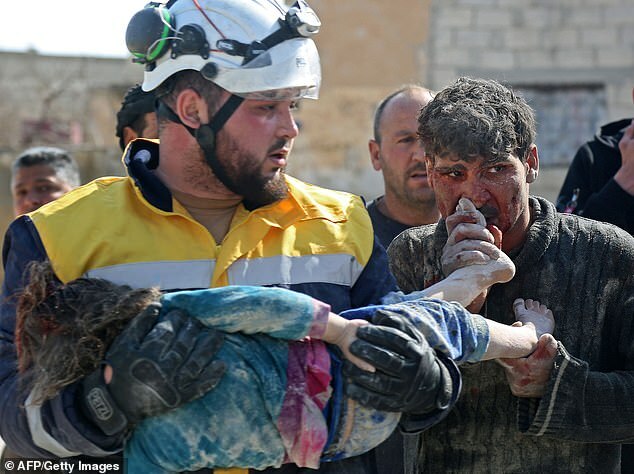 A ‘White Helmet’ rescue worker took hold of the girl to take her to the morgue, as her inconsolable father kissed her feet.